Each set contains eleven figures - Mary, Joseph and Jesus with the three wise men, a camel, a shepherd, two sheep and a donkey. Delivery is normally made within 5 days of order, however at Christmas, delivery can take much longer. Every piece is handmade by me in Nottinghamshire from salvaged solid pine and painted with environment/child friendly paint. 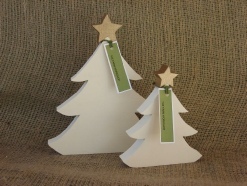 The small Christmas Tree is 16 cm high (6 Inches) and the large Christmas Tree is 26 cm high (10 inches). 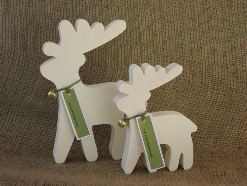 The small Reindeer is 16 cm high (6 inches) and the large Reindeer is 26 cm high (10 inches).